The prepare menu is home to a collection of functions that a user might use to prepare their work for publication, storage or distribution, once they have completed writing the content of the document. This might include adding some meta data to the document (for use in a EDRMS or document management system), adding a digital signature (to ensure the integrity of the document), or even checking that the document is compatible with older versions of Word. This is where you supply key information about the document.In the Document Properties Pane, if you click on the down arrow beside Document Properties you can launch the Advanced Properties box. From this box you can add even more meta data to your document, with another 27 or so different options, ranging from the Client the document is for, to who Typed the document in the first place. The Inspect Document function checks to make sure there is nothing hidden in your document that is not meant to be seen by a user. This is especially important if you have used track changes, hidden some text (when you should have deleted it), or used some meta data internally to classify the document that you do not want the reader to know about. Clicking on the Inspect Document function displays a box which allows you to select the type of document inspection you want. If you are dealing with a small document (say below 100 pages) there is no problem inspecting using all five options. Larger documents lead to longer inspection times, however, so you might only want to inspect for comments, revisions, versions and annotations. 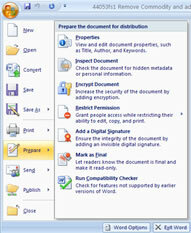 This Prepare menu option allows you to grant specific permissions to viewers of the document. For example, if you only want people to be able to read a document, but not print it or save it, you can grant those privileges using the Restrict Permission option. In Word 2007 you can sign your document. The digital signature added to a Word 2007 document is similar to a written signature you might add to a letter. Marking a document as final marks the document as final, sets the document to read-only, and saves it. 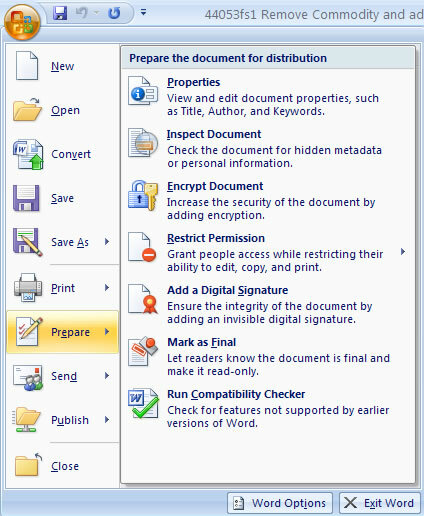 When a document is marked as final a symbol in the status bar appears indicating that this is so, and some of the prepare commands become unavailable. To reverse this action, just repeat the process i.e. click the Office Button > Prepare > Mark As Final. By running the compatibility checker in Word 2007 you can check to see if your document will load in previous versions of Microsoft Word. This is an inportant task to perform if you work in an environment where people who may use your document are working with older versions (even more important if some of those people are customers or suppliers).